A cross between a club/swinging torch and poi. Part Poi and part torch. Club and Torch swinging involves a very short stick with handle and a wick for Fire at the far end. This enables you too stop the swing at any point and change direction with ease. Certainly a more direct and controlled Fire Head which is unaffected by gravity or flexibility from a chain or cord. To increase the moves available to the Torch a small length of chain is added to the end of the torch handle followed by a standard Poi handle. You can now easily switch between Poi style and Torch styles of movement by swapping from the torch handle to the Poi handles. Opening up further the range of movement available and enabling you to extend your skill base. "I had never seen the stick poi before looking for a new staff. I have loved every training session i've had with it. Absolutely amazing!" "this wasnt my first purchase nor will it be my last but for my first set for fire i have fallen in love." "I have been ordering from Home of Poi for a couple of years now for products for my son and it is ALWAYS an exceptionally positive experience. My son loves the quality of their products, if ever I have a question, the folks there are quick to respond. Can't say enough good about them. Thank you." "Amazing buy, been practising non stop since they arrived"
"Glass fiber is able to resist 1000 degrees. This is necessary for anyone, who wants to play with fire." 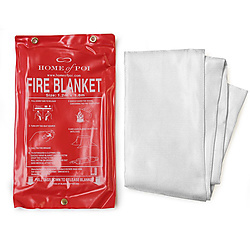 "I received my fire blanket promptly and it was in good shape as advertised. Can't wait to use it!" "Great to have on hand just incase! Thank you for offering such superior products"
"Yep, does what it says on the pack, does it well, and this was cheaper then sourcing one locally!" "If you're using fire, you need one of these. No excuses. Works wonderfully." "The size is great definition of a safe is in the quality of the fabric thankfully i haven't tested it yet.however better to be safe then burning uncontrolled. Thanks home of poi.i rely on you guys for all my professional items for performances"
"I purchased this fire blanket to prove to my friends that yes, there are actual blankets made for this job. That being said, this blanket helps you look professional, is highly visible in case of emergencies and works very well. It's just as important as a fire extinguisher and very reasonably priced." "These are awesome mad love and bless"
"this is my second fire blanket ordered from Home of Poi. it arrived in great time,in great condition. out of all the fire blankets I've used, this is my favorite material and size. it works so well, thank you again Home of Poi"